While Warner Bros owns the rights to just about every important character (and also most of the unimportant ones) in the DC Comics Universe, they don't automatically own every internet domain name related to them. Those you have to actively seek out and register, and that's what they've just done for four (hypothetical) DC movie adaptations - three of which had not been previously announced. TechTimes reports that Warner Bros has registered the domains JusticeLeagueFilm.com, ShazamMovie.com, WonderWomanTheMovie.com and AquamanMovie.com, with all four URLs currently linking back to the studio's main site. 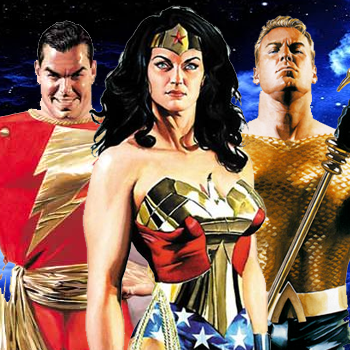 While all four relate to movies long expected to be part of Warner's "DC Cinematic Universe" ambitions, only Justice League had formally been announced. While this doesn't necessarily mean that announcements of these films being in production are imminent, none are exactly coming out of nowhere: Wonder Woman and Aquaman are both known to be part of the upcoming Batman v Superman: Dawn of Justice (widely viewed as a lead-in to Justice League and rumors of Shazam (aka Captain Marvel) have swirled for months.